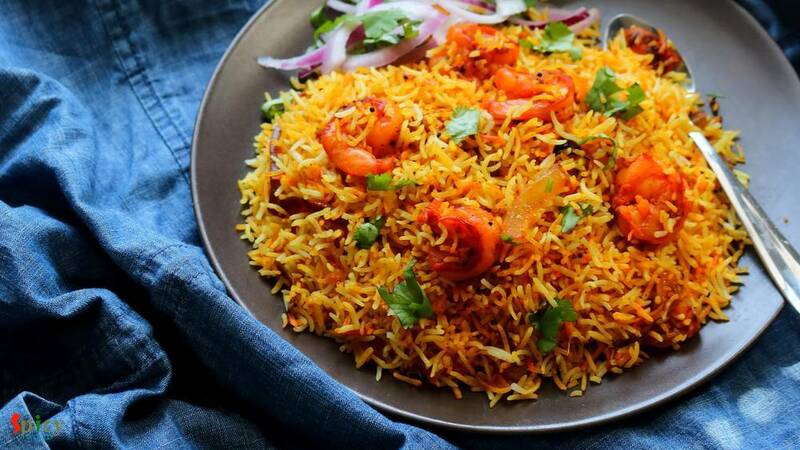 Tandoori Prawn Pulao is a delicious, spicy seafood rice pilaf dish in which Prawns will be marinated with yogurt, tandoori spices and other ingredients then will be tossed with long grain Basmati rice ... so so good! 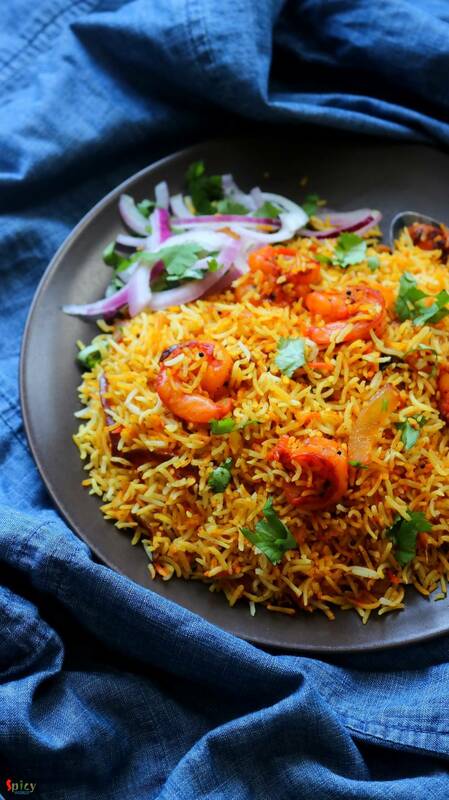 You can have this Prawn Pulao as it is or any kind of gravy on the side will work just fine. The recipe is simple and take very less time to cook. Try this in your kitchen and let me know how it turned out for you. 15 deveined and cleaned big sized prawns or shrimps. 3 cups of long grain basmati rice. 1 Teaspoon of black mustard seeds. 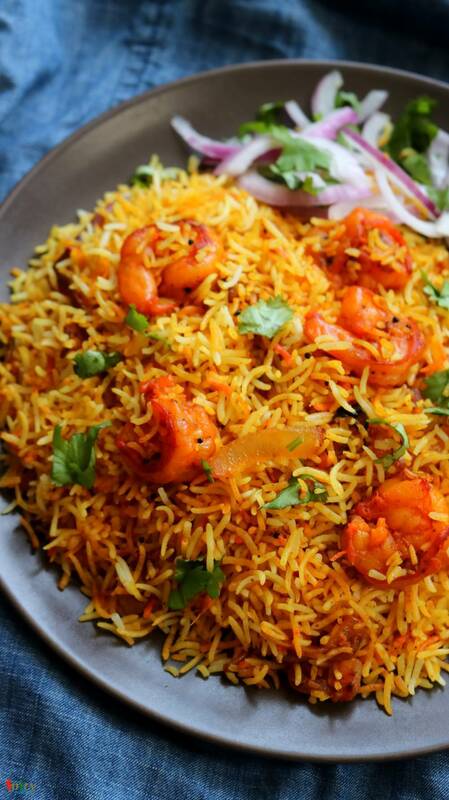 Wash the basmati rice very well then soak them for 2 hours in cold water. Marinate the prawns with ginger garlic paste, salt, turmeric powder, red chili powder, 1 Tablespoon of tandoori masala powder, yogurt and mustard oil. Mix well and keep aside for an hour. Add 2 Tablespoons of salt, bay leaf and black peppercorns. Then add soaked rice, cook until the rice becomes soft, not mushy. Immediately drain them and keep aside. Heat 3 Tablespoons of ghee in a flat pan. Add black mustard seeds and curry leaves. Saute for few seconds. Then add onion slices and cook for 3-4 minutes. Next add the marinated prawns and cook on high flame for 3-4 minutes. Do not cook them long otherwise they will become rubbery. Add the cooked rice. Mix well with a gentle hand. Lastly add the remaining ghee and tandoori masala. Mix well and turn off the heat. 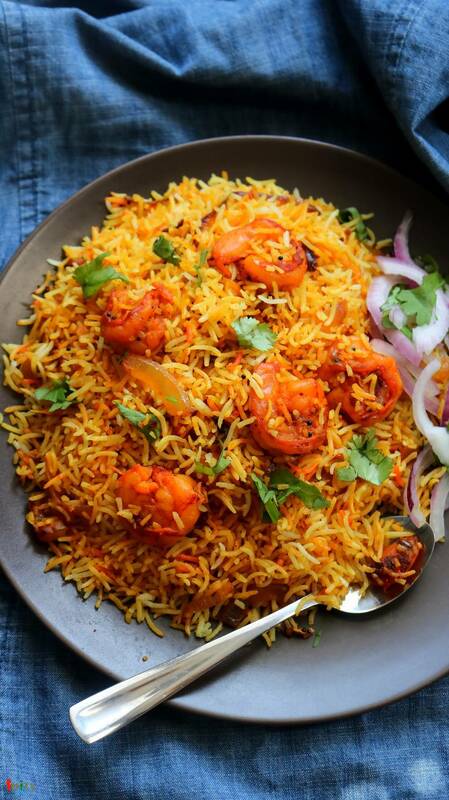 Your tandoori prawn pulao is ready to serve.